So it looks like my minimum possible karaoke pain will be 76 seconds if I go with Anna Kendrick’s Cups. Certainly better than Gun’s in Roses November Rain at 8:57 seconds or Don Mclean’s American Pie at 6:49. But better yet, I can go with Hawaii Five-O . That song is not only short, but has no vocals. With that song I’m sure to be pitch perfect! I still remember the evening well. It was midnight during the summer of 1982. I was living in a thin-walled apartment, trying unsuccessfully to go to sleep while the people who lived upstairs were music bingeing on The B52’s Rock Lobster. They listened to the song continuously on repeat for hours, giving me the chance to ponder the rich world of undersea life, filled with manta rays, narwhals and dogfish. We tend to binge on things we like – potato chips, Ben & Jerry’s, and Battlestar Galactica. Music is no exception. Sometimes we like a song so much, that as soon as it’s over, we want to hear it again. But not all songs are equally replayable. There are some songs that have some secret mysterious ingredients that makes us want to listen to the song over and over again. What are these most replayed songs? Let’s look at some data to find out. 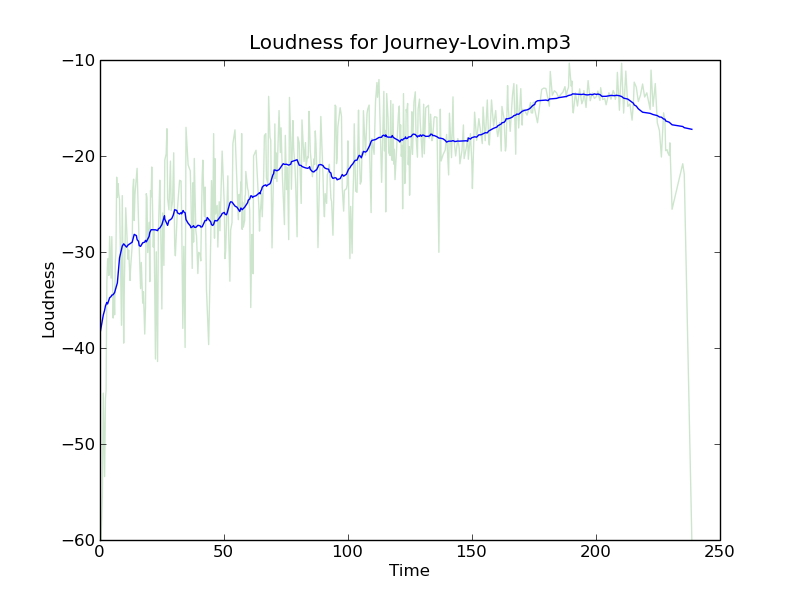 The Data – For this experiment I used a week’s worth of song play data from the summer of 2013 that consists of user / song / play-timestamp triples. This data set has on the order of 100 million of these triples for about a half million unique users and 5 million unique songs. To find replays I looked for consecutive plays by a user of song within a time window (to ensure that the replays are in the same listening session). Songs with low numbers of plays or fans were filtered out. For starters, I simply counted up the most replayed songs. As expected, this yields very boring results – the list of the top most replayed songs is exactly the same as the most played songs. No surprise here. The most played songs are also the most replayed songs. To make this more interesting, instead of looking at the absolute number of replays, I adjusted for popularity by looking at the ratio of replays to the total number of plays for each song. This replay ratio tells us the what percentage of plays of a song are replays. If we plot the replay ratio vs. the number of fans a song has the outliers become quite clear. Some songs are replayed at a higher rate than others. click to open an interactive version of this chart. I made an interactive version of this graph, you can mouse over the songs to see what they are and click on the songs to listen to them. It is no surprise that the list is dominated by background noise. There’s nothing like ambient ocean waves or rain sounds to help baby go to sleep in the noisy city. A five minute track of ambient white noise may be played dozens of times during every nap. 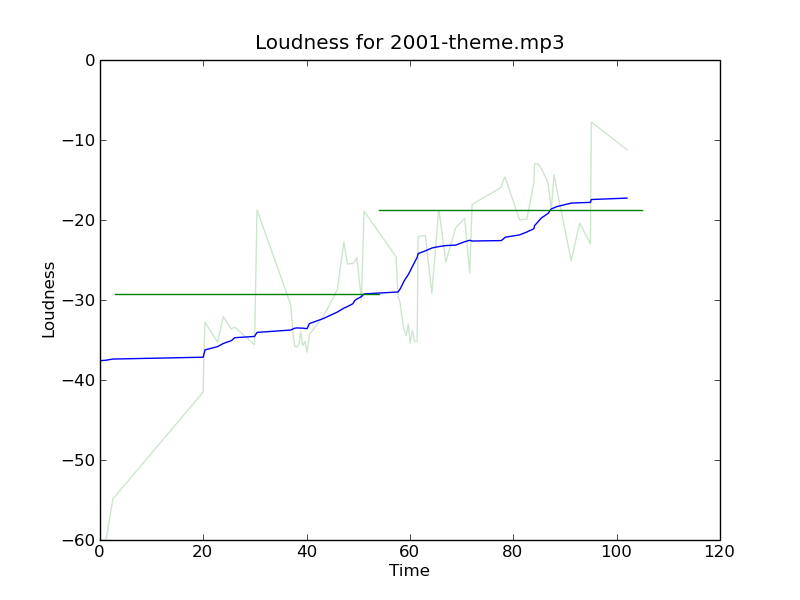 It is not uncommon to find 8 hour long stretches of the same five minute white noise audio track played on auto repeat. Luckily, most people don’t listen to this song even once. It is only part of the regular listening rotation of a couple hundred listeners. Still, it points to a pattern that we’ll see more of – overly sentimental music has high replay value. It is hard to believe, but the data doesn’t lie – More than 30% of the time after someone listens to Miley Cyrus’s The Climb they listen to it again right away – proving that there is indeed always going to be another mountain that you are going to need to climb. Miley Cyrus is well represented – her aptly named song We can’t Stop is the most replayed song of the top ten most popular songs. Here are the top 30 most replayed popular songs in Spotify and Rdio playlists for you to enjoy, but I’m sure you’ll never get to the end of the playlist, you’ll just get stuck repeating The Best Song Ever or Boyfriend forever. More than once I’ve come back from lunch to find that I left my music player on auto repeat and it has played the last song 20 times while I was away. The song was playing, but no one was listening. It is more interesting to find songs replays in which the replay is manually initiated. These are the songs that grabbed the attention of the listener enough to make them interact with their player and actually queue the song up again. 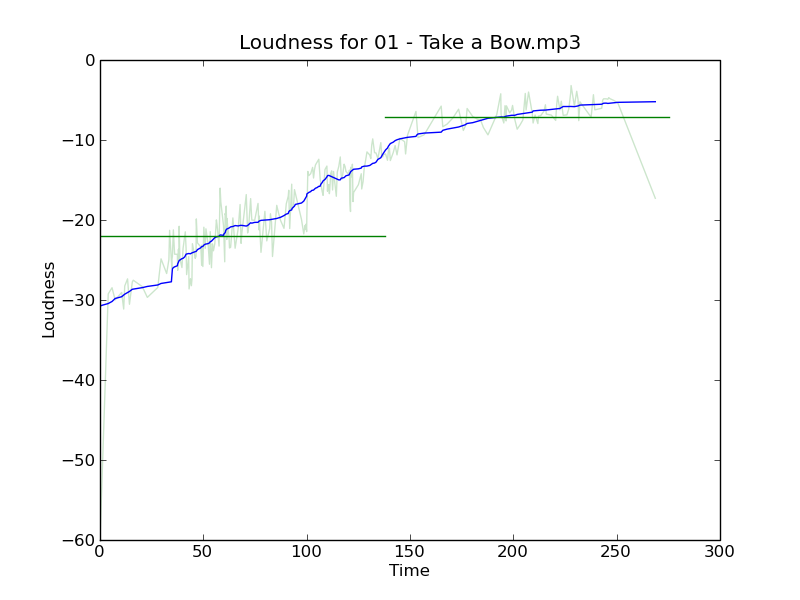 We can find manually replayed songs by looking at replay timestamps. Replays generated by autorepeat will have a very regular timestamp delta, while manual replay timestamps will have more random delta between timestamps. Why do we care which songs are most replayed? It’s part of our never ending goal to try to better understand how people interact with music. For instance, recognizing when music is being used in a context like helping the baby go to sleep is important – without taking this context into account, the thousands of plays of Ocean Waves and Warn Rain would dominate the taste profile that we build for that new mom and dad. We want to make sure that when that mom and dad are ready to listen to music, we can recommend something besides white noise. A number of my favorite songs have this slow build up. The canonical example is Zep’s ‘Stairway to Heaven’ – it starts with a slow acoustic guitar and over the course of 8 minutes builds to metal frenzy. 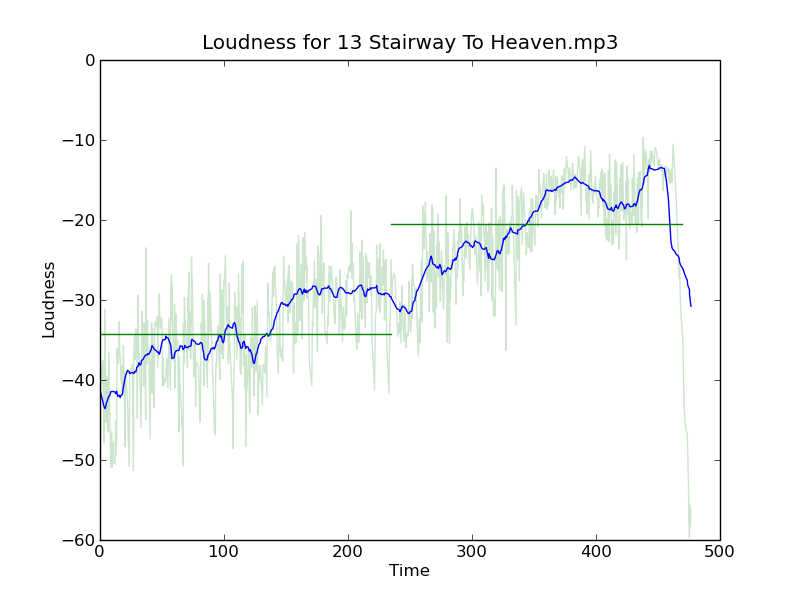 I thought it would be fun to see if I could write a bit of software that could find the songs that have the same arc as ‘Stairway to Heaven’ or ‘Lovin, Touchin Squeezin’ – songs that have this slow build. With this ‘stairway detector’ I could build playlists filled with the songs that fire me up. ‘Stairway to Heaven’ has a score of 1.6 so it has a bigger build than Journey’s Lovin’. Simon and Garfunkle’s ‘Bridge over troubled water’ has an even bigger build with a score of 1.7. 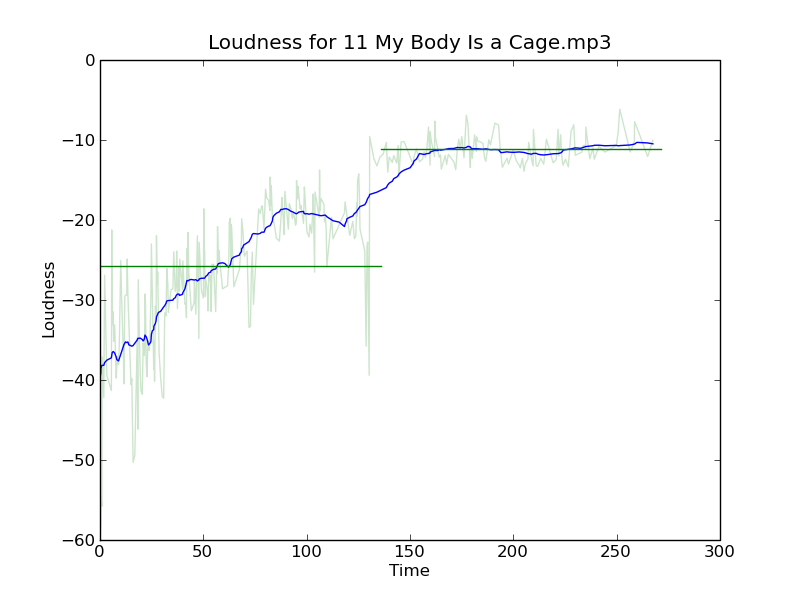 Another find is Arcade Fire’s “My Body is a Cage” with a score of 2.32. After the initial build up, there’s a drop an energy for that last quarter of the song, so even though the song has a sustained crescendo for 3 minutes it doesn’t get a high score due to this drop. 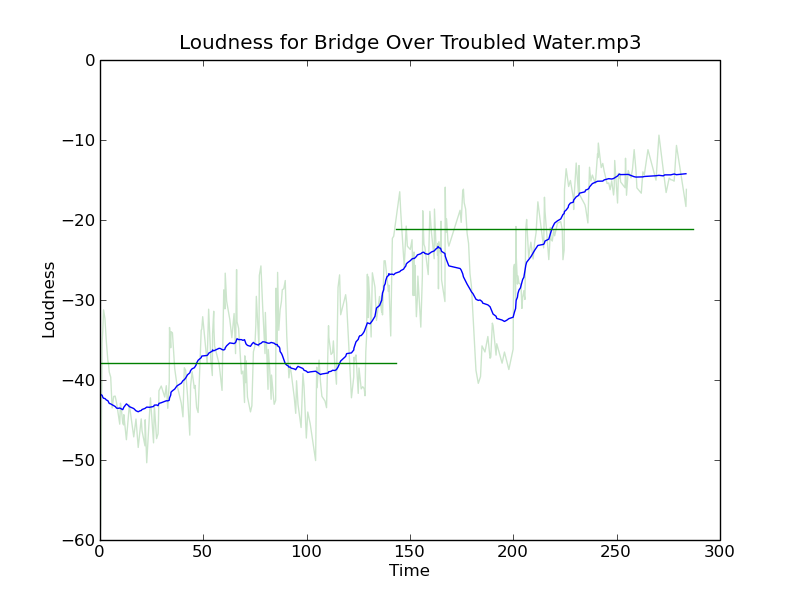 Despite the fact that I’m using a very naive metric to find the loudness slope, this stairway detector is pretty effective in finding songs that have that slow build. It’s another tool that I can use for helping to build interesting playlists. 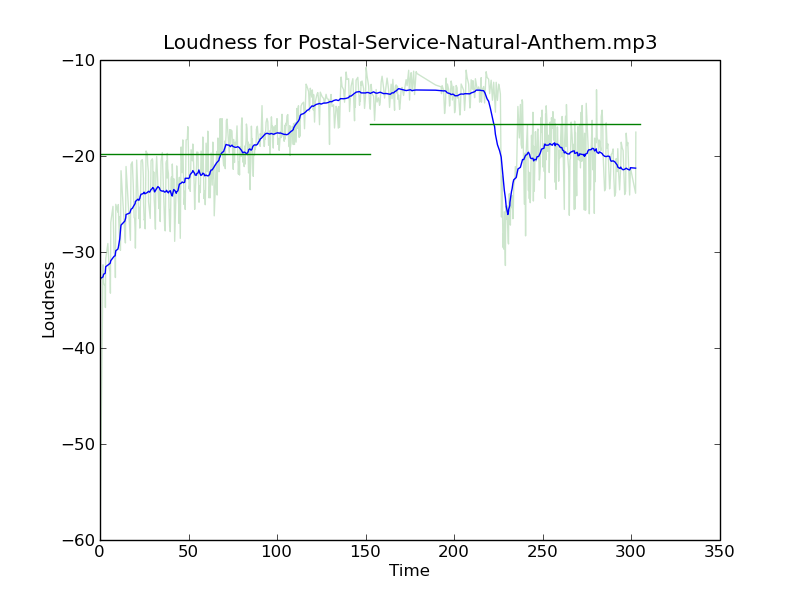 This is one of the really cool things about how the Echo Nest approaches music playlisting. By having an understanding of what the music actually sounds like, we can build much more interesting playlists than you get from genius-style playlists that only take into account artists co-occurrence. The Echo Nest developer web services offer a number of interesting pieces of data about an artist, including similar artists, artist familiarity and artist hotness. Familiarity is an indication of how well known the artist is, while hotness (which we spell as the zoolanderish ‘hotttnesss’) is an indication of how much buzz the artist is getting right now. Top familiar artists are band like Led Zeppelin, Coldplay, and The Beatles, while top ‘hottt’ artists are artists like Katy Perry, The Boy Least Likely to, and Mastodon. In this plot, I’ve take the top 18,000 most familiar artists, ordered them by familiarity. The red line is the familiarity of the seed artist, and the green cloud shows the average familiarity of the similar artists. In the plot we can see that there’s a correlation between artist familiarity and the average familiarity of similar artists. We can also see that similar artists tend to be less familiar than the seed artist. This is exactly the behavior I was hoping to see. Our similar artist function yields similar artists that, in general, have an average famililarity that is less than the seed artist. 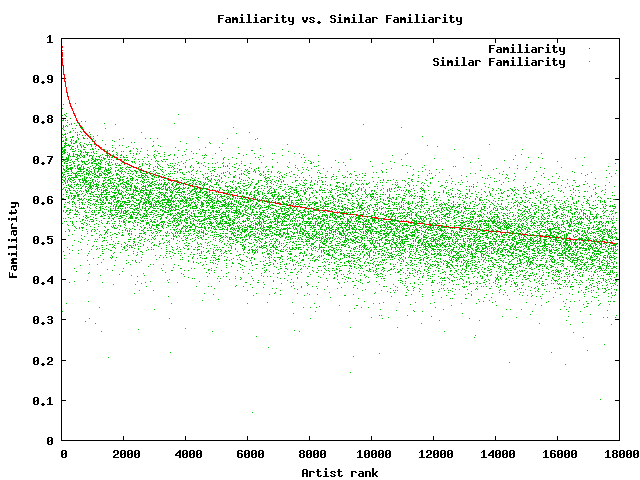 This plot can help us q/a our artist similarity function. If we see the average familiarity for similar artists deviates from the standard curve, there may be a problem with that particular artist. For instance, T-Pain has a familiarity of 0.869, while the average familiarity of T-Pain’s similar artists is 0.340. 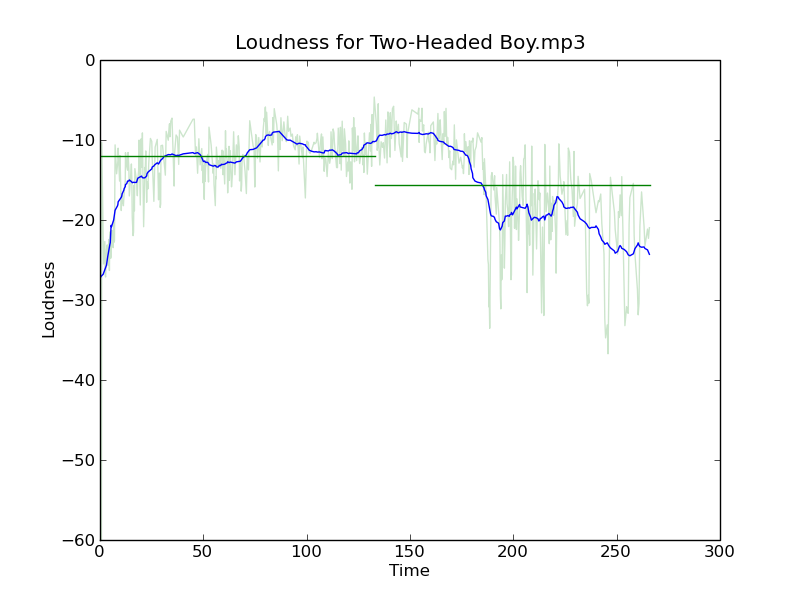 This is quite a bit lower than we’d expect – so there may be something wrong with our data for T-Pain. We can look at the similars for T-Pain and fix the problem. In this plot, the red curve is showing the hotness of the top 18,000 most familiar artists. It is interesting to see the shape of the curve, there are very few ultra-hot artists (artists with a hotness about .8) and very few familiar, ice cold artists (with a hotness of less than 0.2). The average hotness of the similar artists seems to be somewhat correlated with the hotness of the seed artist. But markedly less than with the familiarity curve. 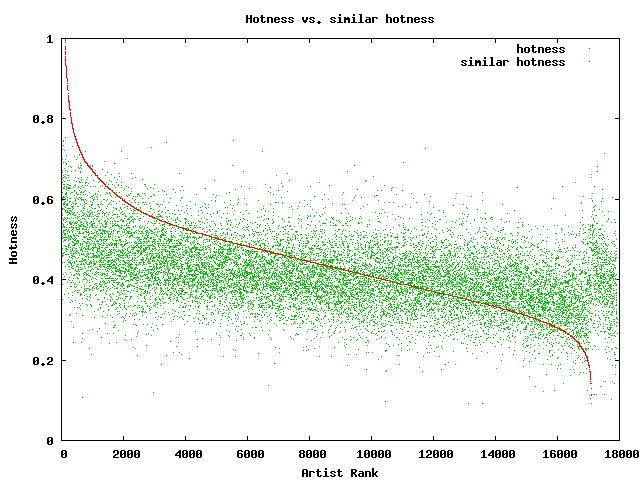 For hotness if your seed artist is hot, you are likely to get less hot similar artists, while if the seed artist is not hot, you are likely to get hotter artists. That seems like reasonable behavior to me. Well, there you have it. Some Monday morning explorations of familiarity, similarity and hotness. Why should you care? 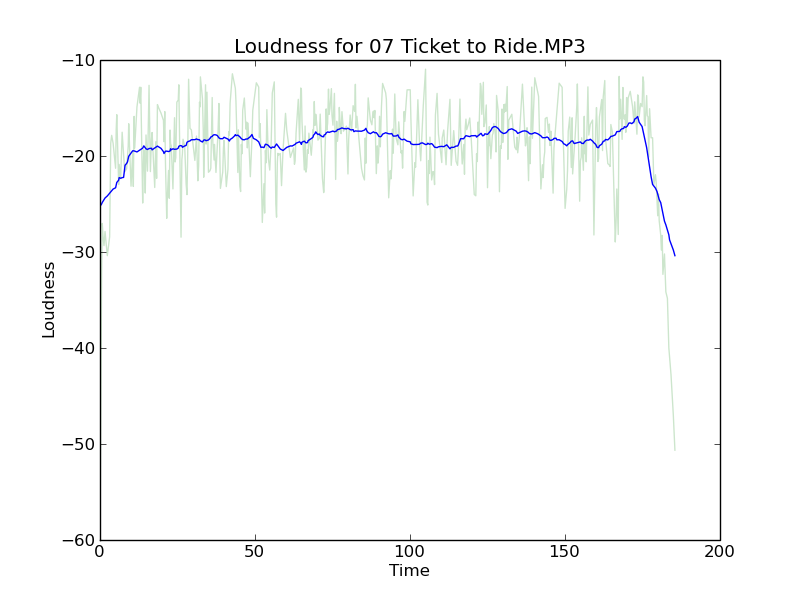 If you are building a music recommender, familiarity and hotness are really interesting pieces of data to have access to. There’s a subtle game a recommender has to play, it has to give a certain amount of familiar recommendations to gain trust, while also giving a certain number of novel recommendations in order to enable music discovery.